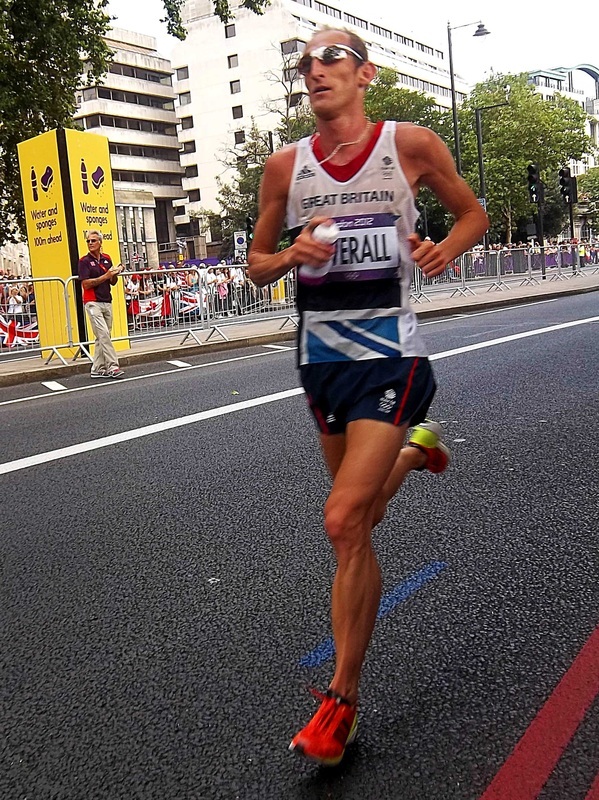 Scott battling the heat at the London Olympic Marathon. I started training with Mo Farah ... Having a training partner like that can do wonders. In 2011 people were scratching their heads wondering who, if anyone, would step up as a serious contender for the London 2012 Marathon. No Brit had run the Olympic A-standard of sub-2:12 since Tomas Abyu ran 2:10 way back in 2007. And few would’ve picked the then 5k specialist and proud Londoner, Scott Overall, to step up to the plate. In Berlin, he sent worldwide message boards scrambling and search engines firing when he surprised everyone in his marathon debut. That day he ran 2:10:55 for an impressive fifth place (first non-Kenyan), stamping his ticket to run in a home Olympic Games. We caught up with him just before the Games to hear what it takes for a London kid to make to an Olympic marathon. How did this running gig start for you? At secondary school I was in Twickenham, which is a big rugby area. I couldn’t really play rugby so the other sports on offer were cross-country and in the summer, track. So I started running for the school. I was decent enough and that lead to joining a local athletics club and I progressed from there really. Kids often have dreams of making it big in their chosen sport, but when did your running dreams start coming in to the realms of possibility? Probably not until I was 17 or 18. I was always ranked around the top ten as a junior and when I was 14 or 15 I started training with Mo Farah. Me and him were in the same club and trained together for years. Having a training partner like that can do wonders. In 2004 you took up a running scholarship at Butler University in Indiana, USA. What effect did that have on your running career? Then there were a lot of athletes going out but certainly not as much as there are now. It was a new opportunity to study abroad and have a new experience. Going out there really changed my view of running and how hard you have to train to compete with the best guys. The standard of college athletics out there is massive. It’s a lot better than it is here. You have to run fast to compete. It definitely progressed me and helped me a lot more than it would have if I stayed in England. And you stayed on in the States to train post-College? Yeah, I finished Butler in 2007 and my coach Robert Chapman was setting up a post-collegiate training group in Bloomington, Indiana. So I stayed out there training trying to qualify for the Olympics the following year. That next year, in 2008, I ran 13:28 in the 5k, which was a B-standard. But I didn’t go to Beijing, but did go to the World Indoors in 2010 where I ran the 3k. So when did this good 5k runner start thinking he could be an A-standard marathon runner? In 2011 I was doing everything that I had previously done. Going up to Flagstaff every year training [at altitude] to run a 5k or 10k on the track. I ran 13:28 in 2008 and that’s still my PB now so I didn’t seem to get much quicker. That year I went to Flagstaff in April with the aim of running a fast 5k in either Mt Sac or Stanford. But that didn’t happen even though my training was going great. So then they had a half marathon in Indianapolis a week after Stanford and I decided to do it. I did and I ran 63:20. That was off 5k training, so I thought if I actually trained for the half marathon and marathon I could actually run a bit quicker. So I came back to the UK in June of 2011 and sat down with Dave Bedford about my ideas of running the marathon. Berlin was looking like the next opportunity for a very fast marathon and a decided to do that. Going into Berlin were you thinking an Olympic qualifier was on the cards? Or were you just out to race for a place? The way the training had gone I thought I was in shape to run 2:12. Berlin was simply to qualify for the Olympics and that’s all I was thinking about. I didn’t know I had finished fifth until someone told me. To me the position didn’t matter so long as I ran the time.